For professional bouncy waves or defined curls, you don't need to rely on your salon. 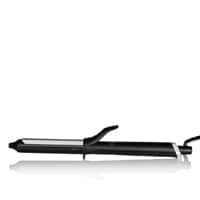 The ghd curve® range of tongs is an essential styling tool to help you get those long-lasting curls, whether you’ve got long or short hair. Using the patented tri-zone® technology, you’re guaranteed ultimate curls thanks to the ghd curve® tongs optimum curling temperature of 185°C and quick-thinking sensors maintain this heat and keep it even along the barrel, meaning that your hair is cared for while you're styling. Choose the ghd curve® classic curl tong if you’re looking to achieve an effortless classic coveted curl look, or the ghd curve® soft curl tong is the perfect tool for glamorously bouncy curls that will last all night long. To create gorgeous curls, use the ghd curl hold spray with our styler. Get guilt-free styling thanks to the added heat protection and lock in your curls through the day and the night. Das Gerät liegt gut in der Hand und ist solide verarbeitet. Die Locken gefallen mir sehr gut, halten aber nur ein paar wenige Stunden. Das Haar sieht aber auch nach Aushängen der Locken wunderschön und gepflegt aus. Ich habe das Gerät auf Wunsch meiner Tochter ausgewählt und soweit ich das beurteilen kann, ist Sie mehr als zufrieden damit. Entdecke unser Sortiment an professionellen ghd Stylern für geschmeidige, glatte und schonend gestylte Haarstyles, die halten. Wir präsentieren unser Sortiment an professionellen ghd Haartrocknern für schnelles Trocknen und einen hochwertigen Look, wie vom Profi. Kreiere Deinen ultimativen Haarstyle mit einer Kollektion von ghd Stylingprodukten inklusive unserer fortschrittlichen Haarstyling Technologie. Verleihe Deinem Haar mit dem ghd Haarbürsten Sortiment jeden Tag ein Salonfinish.